I noted in a recent post EDF’s grave concerns about the Regulatory Accountability Act (RAA), which passed the House on January 11. A shorter but still very concerning version of it may soon be introduced in the Senate, modeled on last Congress’ Senate version of RAA. This bill would add dozens of burdensome and time-consuming hurdles to the rulemaking process, effectively crippling it and eliminating the health and safety protections rules are intended to provide. 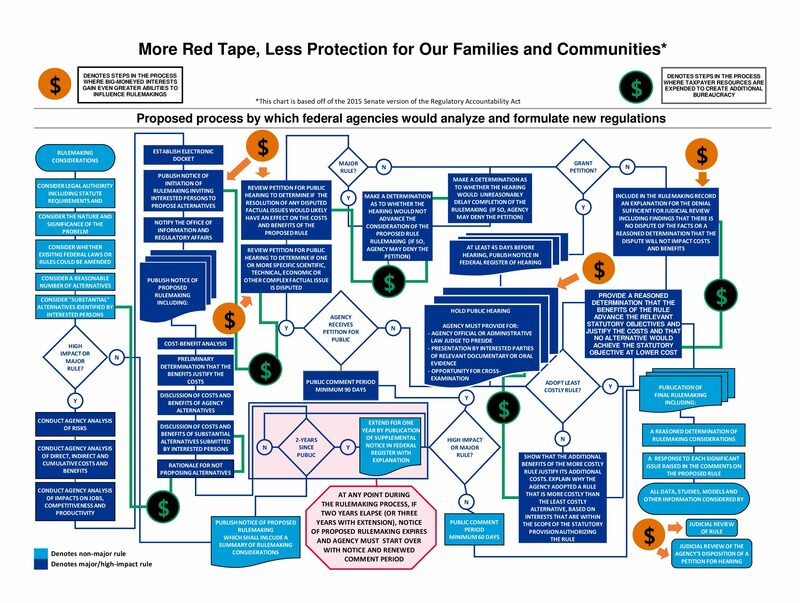 To get a feel for all of the requirements, see this dizzying RAA flow chart. Among other things, the RAA would mandate multiple rounds of cost and impact analysis of a potentially unlimited number of regulatory alternatives; require that all major rules go through an entirely new pre-proposal step, adding months if not longer to the rulemaking process; generally require that agencies choose the lowest-cost regulatory option, regardless of whether or not it is the best option or even sufficient to meet a law’s requirements; and require lengthy and resource-intensive public hearings on many rules. To top all this off, the bill would require an agency to finalize a proposed rule within 2 years (subject to a 1-year extension) – a timeframe almost impossible to meet now without all of the additional requirements the Act would impose; if that deadline was not met, the agency would have to start over. There is extreme irony in the advancement of the RAA in this Congress: Just last June, both houses of Congress passed – with overwhelming bipartisan support – major reforms to the obsolete Toxic Substances Control Act (TSCA). The Lautenberg Act removed from the original TSCA several major constraints on the rulemaking process that had so tied the hands of the Environmental Protection Agency (EPA) that it could not even restrict asbestos, a known carcinogen that kills more than 10,000 Americans every year. There was widespread agreement among industry and other stakeholders that those provisions of the old TSCA were detrimental or unnecessary to an efficient regulatory system and were undermining public and market confidence in the federal chemical safety system – not to mention failing to protect public health. COST-BENEFIT CONSIDERATIONS: As interpreted by the 5th Circuit in Corrosion Proof Fittings v. EPA, in order to regulate a chemical under the old TSCA, EPA had to conduct quantitative cost-benefit analysis (CBA) on a potentially limitless number of regulatory alternatives, regardless of whether information was available. This requirement, coupled with the “least burdensome” requirement discussed below, is widely regarded as the most fatal flaw of the old TSCA, imposing virtually impossible evidentiary and analytic burdens on EPA. The Lautenberg Act fixed these problems: It requires EPA only to “consider and publish a statement on” the economic effects of a rule, and to do so only: i) “to the extent practicable,” ii) “based on reasonably available information,” and iii) “for the 1 or more primary alternatives considered by” EPA. It provides EPA with considerable discretion to limit the extent of analysis so that it is feasible. LEAST-COST REQUIREMENT: The original TSCA required that EPA prove its selected regulatory requirement was the “least burdensome” of all possible options sufficient to address the problem. The Lautenberg Act struck this requirement entirely. Yet under the RAA, for all major or high-impact rules, EPA and other agencies would be required generally to adopt the “least costly” rule and prove that no lower-cost option is sufficient; an exception is provided where EPA could demonstrate, through even more analysis, that the additional benefits – which could not count any ancillary benefits – of a more costly rule justify the additional costs. Yet, in contrast to costs, many benefits are very difficult to quantify or monetize and hence get short shrift in such cost-benefit analyses. RULEMAKING STANDARD: As just noted, TSCA originally required that EPA’s regulation to address an identified risk protect adequately against such risk using the “least burdensome requirements.” It allowed a rule that did not actually eliminate the risk if the rule was deemed too costly. A key reform made by the Lautenberg Act is that it precludes EPA from adopting a rule that does not eliminate an identified risk, which is to be determined without consideration of cost; then, in regulating such risk, EPA must consider costs – but only in deciding among different regulatory options each of which is sufficiently protective. Moreover, these cost factors are only required to be considered, and EPA is not required to prove that an option meets a specific test (e.g., lowest-cost). The RAA only generally indicates that a rule is to “meet relevant statutory objectives” – a vague term that does not require that a rule be sufficient to meet all requirements of the law that mandates or authorizes it. In contrast, the bill’s language on cost requirements does not make clear that a rule not meeting a health-based standard would not be allowed. REQUESTS FOR HEARINGS: Under the old TSCA, any person could request EPA to hold a public hearing on any rule. The Lautenberg Act struck this provision as unnecessary and overly time- and resource-intensive. It was struck based on agreement among stakeholders that hearings were not needed and would make it impossible for EPA to meet the new law’s rulemaking deadlines. Under the RAA, any person would be able to request a hearing on any major or high-impact rule, other than a rule “required by law” that is not a high-impact rule. An agency would generally have to grant the request if any factual issue is in dispute, which is nearly always the case at some level. Under this approach, any entity that wanted to drag out and obstruct a rule would have a ready opportunity to do so. DEADLINES: The old TSCA imposed no deadlines on EPA to identify or take action to address unreasonable chemical risks. The Lautenberg Act imposes judicially enforceable deadlines on EPA’s proposal and finalization of risk management rules. Critically, however, failure to meet a deadline does not relieve EPA of its obligation to complete the rulemaking. The RAA perverts the very accountability that deadlines under the new TSCA and most federal statutes are intended to provide. If an agency did not complete a rulemaking with 2 years of proposal (subject to a 1-year extension), the rule would be voided and the agency would have to start over – further delaying needed action to protect health or achieve a law’s key objectives. This “reverse deadline” would apply to all rules. Two years is highly ambitious to meet even under current rulemaking procedures, and agencies have rarely done so. Coupled with all of the new procedural, analytic and evidentiary hurdles to rulemaking imposed by RAA, this deadline would be virtually impossible to meet and would mean virtually no regulations of any substance could be finalized. Less than a year after Congress overwhelmingly adopted the Lautenberg Act – the first major federal environmental legislation enacted in over two decades – some in Congress are now threatening to impose across all of government the same paralyzing mandates that were just removed from the original TSCA by passage of the Lautenberg Act. Lest anyone think I’m suggesting simply exempting the Lautenberg Act from the RAA, let me be clear that is no solution at all. Congress passed the Lautenberg Act in order to restore public and market confidence in a key element of the federal safety net. This step was also acknowledged as necessary to provide the business community with the regulatory certainty it needs to operate. These are needs that cut across the entire federal landscape. The very real threats – to public health, to our communities and to our environment – posed by the RAA suggests some in Congress have very short memories. This entry was posted in EPA, Health Policy, TSCA Reform and tagged Lautenberg Act, Regulatory Accountability Act. Bookmark the permalink. Both comments and trackbacks are currently closed.